The perfect storm of the EAB tree removal and reconstruction plans caused the project to be delayed a year. Recently, the Marquette Neighborhood Association made a host of recommendations to City Engineering regarding the project. A silent protest asks people to imagine the future without the vaunted Jenifer Street tree canopy. These recommendations included narrowing the street, expanding the depth of pedestrian bump-outs at street crossings, stop signs and traffic humps; all in the name of traffic calming which has always been an issue on Jenifer, especially during rush hour. Other requests focused on construction standards to reduce vibration damage to historic homes and partial undergrounding of power lines to allow preserve the current and future tree canopy. A City Council hearing this week on the project was held to consider a modified plan negotiated between District 6 Alder Marsha Rummel and Engineering. The revised plan would indeed narrow the street to 38 feet but would keep bump-outs at three feet instead of the five requested by MNA, which they point out is the national standard. Speed humps and stop signs were not added since Madison Metro successfully argued that they would not be able to maintain their time tables. The narrower street will spare damage to some of the root systems for some of the trees that remain as a wider terrace will also allow them to absorb more water. Still unknown is if a number of the trees will be spared if enough money is raised to underground power lines. 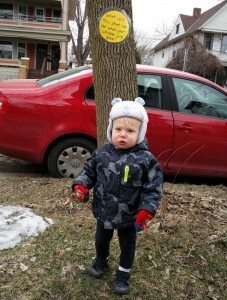 Crews tied yellow ribbons around approximately 10 trees which could be spared if the City and residents can agree to a funding formula that would place the highest overhead lines below ground. That solution may be a either self-funding from residents or possibly a modification of the TIF rules in the area to free up money from the City which they have said in the past is not in the capital budget for such a project. Madison Gas & Electric says they cannot fund the undergrounding due to possible state regulatory hurdles but is willing to work with the City and residents on a solution. This entry was posted in Madison, Uncategorized, Willy Street, Willy Street Commentary by TheEastSider. Bookmark the permalink. Why doesn’t the city use special assessments to cover the cost increment between overhead and underground cabling? The useful life is for electric lines is something like 40 years, so even amortizing that cost over 20 years would probably be palatable to Jenny street homeowners, who get to save their tree canopy while adding value to their home by removing unsightly wires. If not underground lines, which would be preferable, how about leaving taller trees on the side of the street without power lines and shorter ones on the power line side? We need a canopy! Agreed. 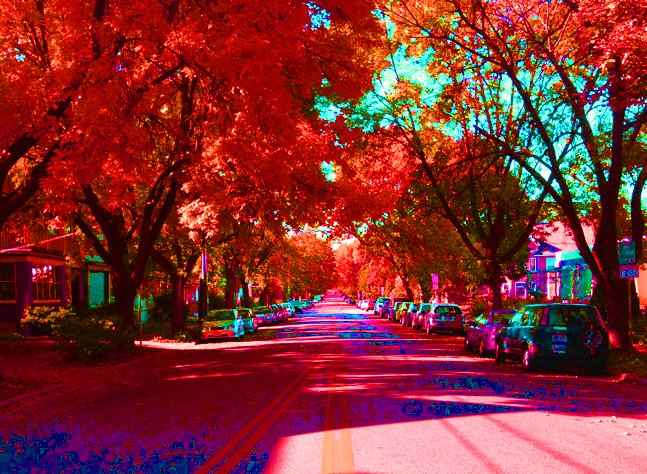 I recently left Madison; studied landscape architecture, lived on Jenifer St. and nearby, and I’m thinking of starting a tree initiative in a blighted (impoverished) rust city near my hometown. Sometimes engineering-types in first-class towns like Madison lack an understanding of what they have (trees and tree culture). What’s my point? Jenifer already has shade trees, and that’s a (relatively) big deal. Madison and Jenifer homeowners have the money to ground powerlines, and, if it were solely an economic argument (which it is most definitely not), the preservation of shade trees would (seemingly) pay for itself with the grounding of the lines over 20-50 years (a timeframe relevant to both electrical lines and shade trees). Secondary factors like bus routes and powerlines should be more adapted to fit human-conducive streetscapes. What’s the value of an otherwise beautiful street with one section of butchered trees compared to a street full of shade trees (?) that’s the relevant question. whole is greater than sum of parts in this case.